They have these commercials now for Ancestry dot com where people take a genetic test and are surprised to find that whatever nationality they grew up believing they were is either completely wrong, or only partially accurate. Neither side of my family ever talked about our nationality or heritage. There were no traditions, stories, artifacts from our ancestors... nothing. But with a name like Vaultonburg I always thought it was fair to assume I was of German origin. I never questioned that at all. However, every time I asked a fluent German speak what the name Vaultonburg means in German they answered "nothing." I always personally fancied it meant something like jump over the mountain, but it doesn't. It's gibberish. A few months ago my partner Jenny signed up for a data base at the local library where she could old archives, including newspapers, city records, etc remotely from her computer. Naturally she was curious about my name and looked it up. It turns out the name seems like gibberish because in fact, it is. It is a version of another name that was most likely changed due to a clerical error when someone was unable to write their name, or maybe just from someone who wanted to Americanize a harder to write name... Van Valkenburg. My nearest ancestor that I can trace with that name was a John Van Valkenburg, and he changed the name circa 1880. Why he did it, I can't say, maybe he just liked it better that way. But it gets cooler. 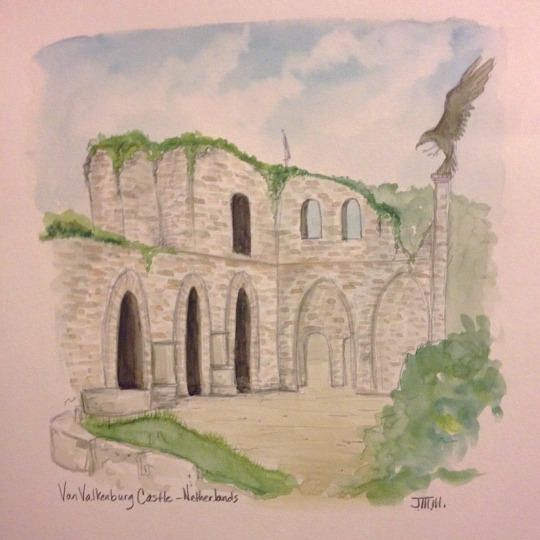 Because it turns out there is a Van Valkenburg castle in... Holland. Yay. Well, that's not entirely the case. It is in a region of Holland enveloped by Germany, and has changed hands from the Romans to the French to the the Germans and back to the Dutch over the centuries. Currently it is in Holland. The possibility that I might be Dutch interests me. Maybe I will send off for that genetic test. And maybe I'll end up learning I'm Irish. Tradition never mattered in my family. There's no reason to believe I have any hope of recovering a part of my heritage now. And frankly, in America it's almost totally irrelevant. But, damn, isn't that a cool name? Thomas L. Van Valkenburg. I could be a long lost cousin of the Van Halens, or a lot of other Vans. Anyway, I wrote this blog so I could show you the magnificent painting Jenny did of "my" castle. I hear it is quite a tourist attraction for jet setters. I may go there one day and retake it symbolically.